Middle Brighton Vet Centre promotes responsible pet ownership & encourages good behaviour in all pets. We conduct Puppy Preschool on a regular basis, where we aim to teach puppies good manners in a safe and relaxed environment. Classes are held on Tuesday evenings at the clinic in 4 week blocks starting at 7pm for 1 hour, with Dr Anna. Each class comes with written information and homework! 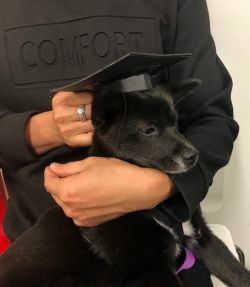 This is a really fun night where we get to see how far the pups have come with our Graduation class. We go over what we have learnt over the past 4 weeks. In the months of daylight savings we conduct some of the classes at Dendy Park to give the owners and pups some real life skills on how to behave and stay safe at the park. Dr Anna Platt has a particular interest in behaviour and commenced Puppy Preschool at Middle Brighton Vet Centre over 18 years ago, and can be consulted when problems with behaviour or training arise. If you believe that your pet has developed a behavioural problem, then contact the clinic to arrange a specific Behavioural Consultation. 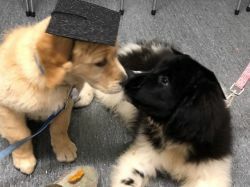 We had a fabulous group of puppies graduate from our Puppy Preschool in July.... We missed Odie the GSHP from graduation night.